Opens: April 11 at New York’s Film Forum, 209 Houston St. In the film’s sharpest quote, documentary director Rüdiger Suchsland reminds us of Hannah Arendt’s pithy bon mot that “What convinces the masses are not facts, not even invented facts, but the consistency of the illusion.” Remarkable, isn’t it, how this could be applied to our own U.S. government, whose commander-in-chief dismisses science as fake. Then, through the repetition of the Big Lie, he tries to influence our thinking about the comically absurd notion that Russia did not collude in the 2016 presidential election, that the New York Times is failing, that America is becoming great again. And when he as recently as April 2018 announced “Who will pay for the wall?” receives the reflexive cheer “Mexico.” He seems to have succeeded in convincing large groups of its absurdity simply by being consistent. Some of us have illusions. And illusion was the name of the game in Germany between the accession of Hitler in 1933 and his downfall in 1945. Understanding that to infuse the German nation with courage, with joy, with the belief that the thousand-year Third Reich would make Germany great again after its defeat in World War I, he entrusted Joseph Goebbels with the job of propaganda chief. Goebbels would control the media. After the shutting down of all independent and private film companies, Goebbels took on the task of censoring, encouraging, discouraging and pretty much directing German cinema behind the scenes during that barbaric period in his country’s history. 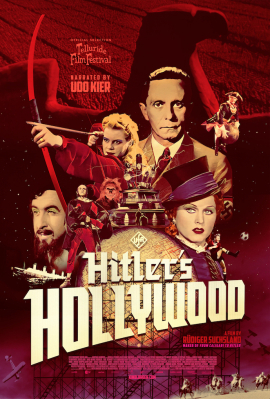 “Hitler’s Hollywood” unfolds all manners of German filmmaking with scores of shots from that country’s productive celluloid mills. Two themes emerge: A) Germans are joyful; and B) Germans yearn for death in the service of the Fatherland. If the latter notion brings the jihadists to mind, you’ve been paying attention. Some one thousand movies produced by Germany from 1933-1945. Some are lavish like our own musicals of their golden age here in the U.S. (think of “The Music Man,” “Meet Me in St. Louis,” “South Pacific,” “Carousel”) while evoking as well “Chiquita Banana” with its kitschy Latin beat, bursting forth with a song that would become the banana brand’s commercial theme. Of the 1,000 productions, director Rüdiger Suchsland—whose “From Calgari to Hitler” focused on the collective cinema spirit of the Weimar Republic—500 were comedies, 300 were melodramas thematically about dying for the Fatherland, most of the rest included war movies and costume dramas. Films promoting anti-Semitism seem surprisingly few, perhaps because the propaganda ministry did not want the public to face its reality. Among the exceptions was one in which the idea of euthanasia is pronounced, specifically for the old and infirm. Rather than give a laundry list of the most kitschy, the most evil, the most lavish of the films, you are encouraged to check the complete list on Wikipedia: https://en.wikipedia.org/wiki/List_of_German_films_of_1933%E2%80%9345. There you may figure out which of the final movies of that government challenged the big money of Hollywood and Bollywood with its cast of 100,000 largely uniformed extras and ten thousand cannons.